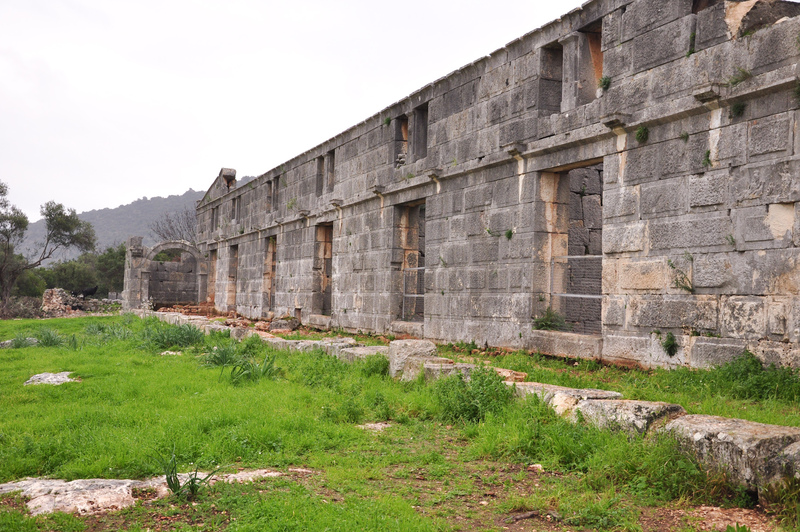 Andriace (also Andriake) is a port city located on the southern coast of Turkey in an area known in ancient times as Lycia. 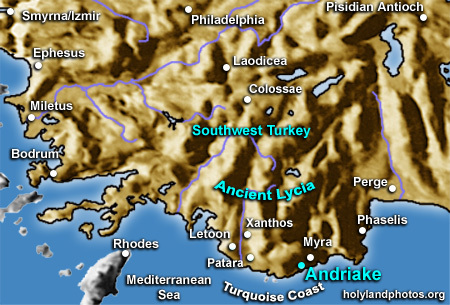 Andriace served as the port of Myra that is located 3 mi. [5 km.] to the northeast. It evidently was a major point for the trans–shipment grain. The grain came from the plain near Myra, and possibly from cargo ships, bringing it from Egypt. 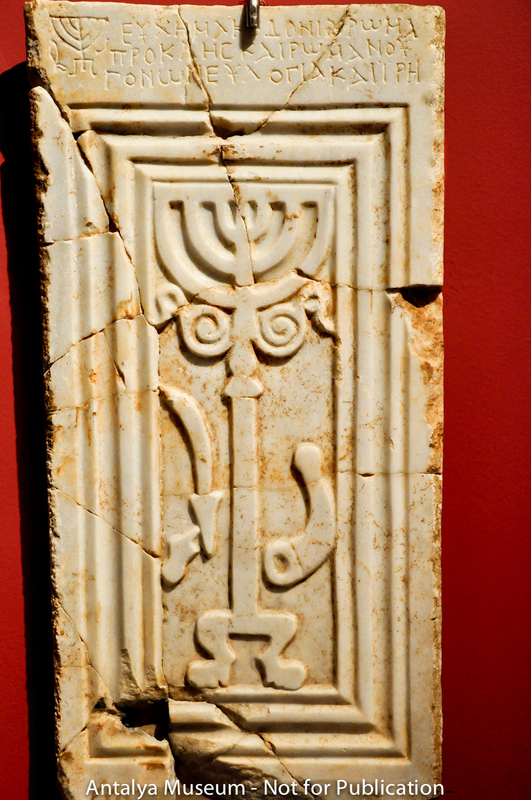 From Andriace it was shipped to Rome or to other parts of the Roman Empire. 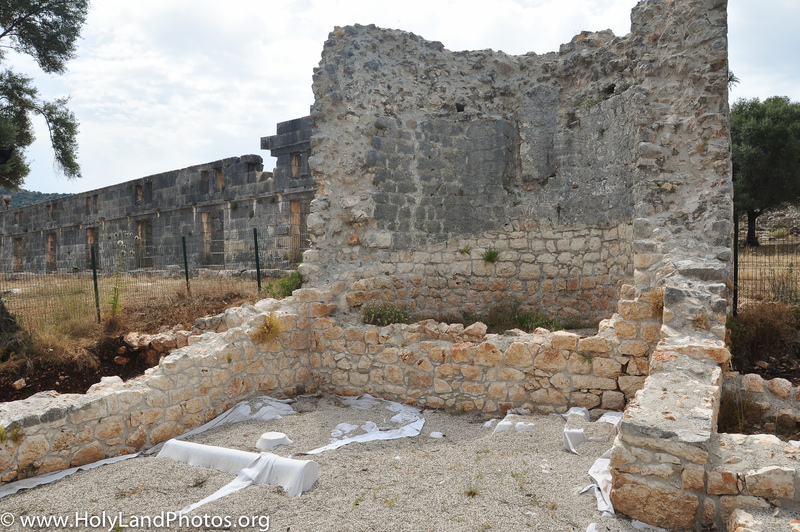 Much of this must have transpired in Andriace, the port of Myra. 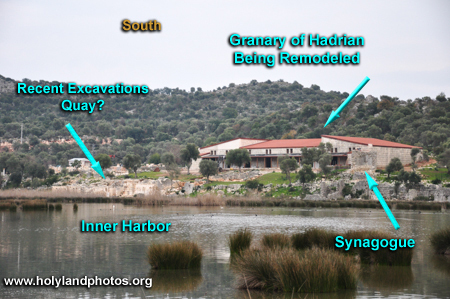 View looking south at the “synagogue” that was discovered at Andriace. 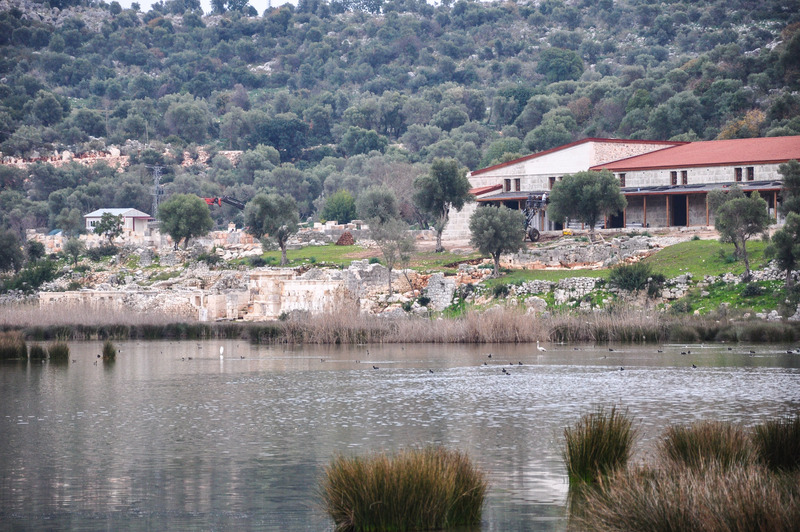 On the left (east) side of the image, behind the people, Hadrian’s granary is visible. 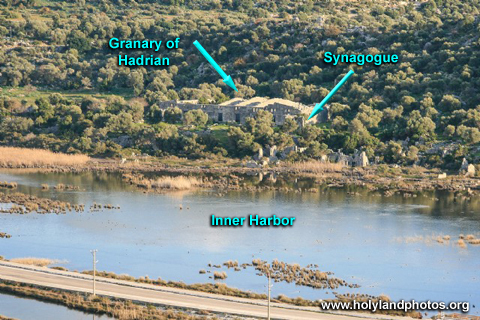 The “apse” of the synagogue appears to be facing south—approximately towards Jerusalem—which is southeast of Andriace. The proximity of this structure to the granary is also interesting. Fifteen images of Andriace are available by Clicking Here. 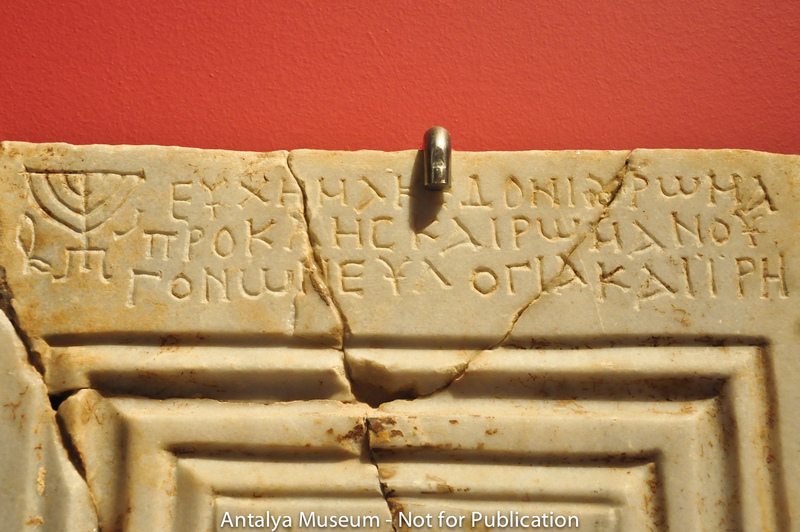 A report on the excavations and inscriptions at Andriace can be found in Nevzat Çevik, Özgü Çomezoglu, Hüseyin Sami Öztürk, and Inci Türkoglu, “A Unique Discovery in Lycia: The Ancient Synagogue at Andriake, Port of Myra.” Adalya XIII (2010), 335–66. 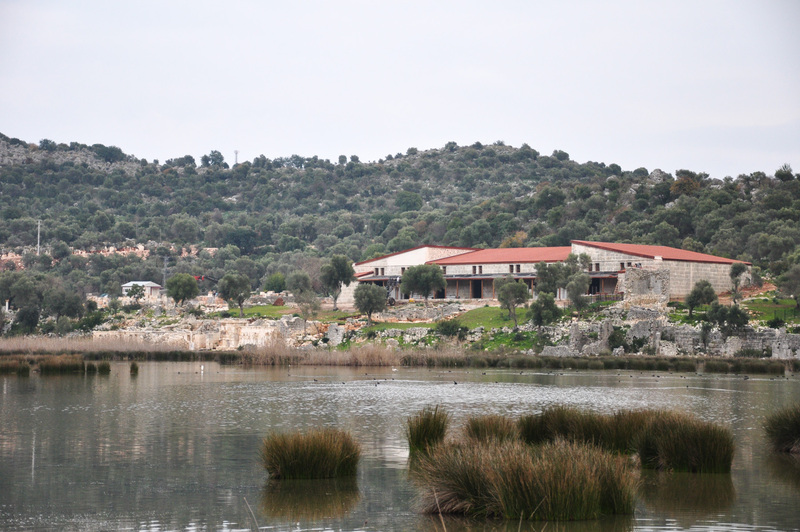 On January 12 our group of Bethel University students, led by our Turkish guide Özcan Kaçar, attempted to visit Andriace, a port where Paul stopped on his way to Rome as a prisoner (Acts 27:5–6; see previous posts here). Unfortunately for us, major construction work is going on there as they prepare to make this important site more “tourist friendly” and we were not allowed to approach the site. In the “old days” we use to have to walk through underbrush and swamp to get there. It looks like there will be a major visitors’ center at the entrance to the site and that the granary will be a museum. 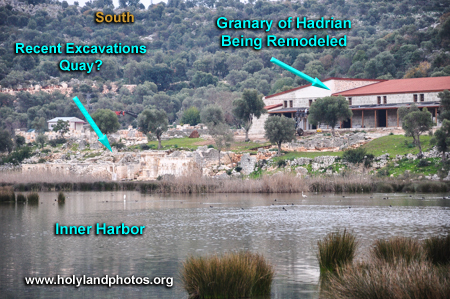 Since the ship that Paul landed at this port, it will be interesting to follow the results of the ongoing excavations at the edge of the harbor.